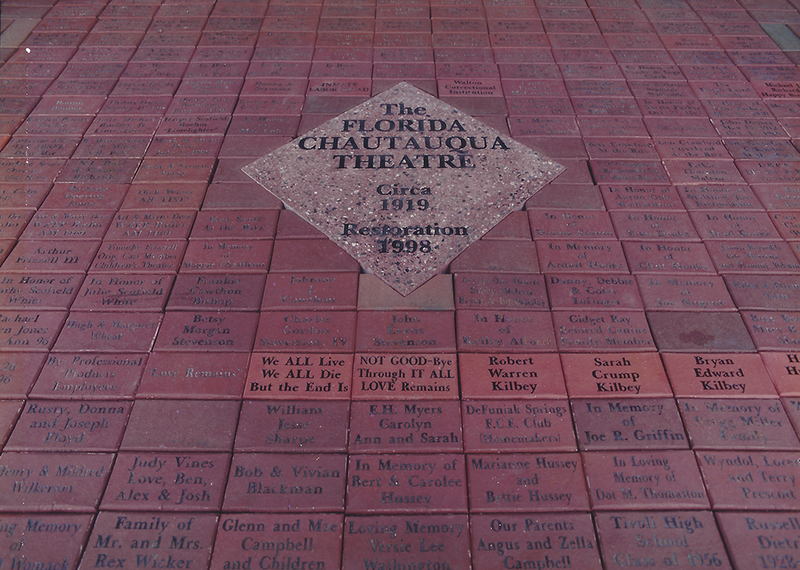 Commemorative Brick | The Florida Chautauqua Inc. The Florida Chautauqua Inc. invites you to take part in an exciting opportunity to support the theatre in an affordable, meaningful way by participating in the Commemorative Brick Campaign. We hope that as a member of our audience, you have experienced productions at the theater that have been exceptionally memorable! We invite you to proclaim your love of theater, celebrate a birthday, commemorate a special milestone, or honor someone close to you by purchasing an engraved paver in front of the Florida Chautauqua Theater! What a wonderful way to honor your favorite thespian, musician or loved one with this eternal show of support. PLEASE NOTE: Bricks will be produced in batches. It could take some time before your brick is installed in the sidewalk. Phone: Please call 850-892-9494 with the exact information that you would like engraved on the brick and complete credit card information. Commemorative Brick Form: Please print and complete this form.